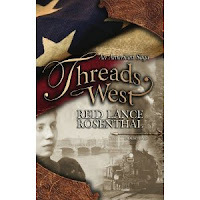 Threads West takes you on an unforgettable journey as we follow the lives of seven individuals who embark on a new life, traveling to the "New World", during the mid-1800's. The story is rich, the imagery colourful and the characters are strong and believable. The pages are filled with passion, murder, mystery, sadness and humour. You will be drawn to the American frontier while unveiling the secrets that each of the characters hold. With each introduction, we learn each person has their own agenda for heading to the wild lands of St. Louis and beyond...Johannes, a lady's man, exiled from his home country; Reuben, 2nd son of a well-to-do rancher, on a quest to fulfill his dying fathers last wishes; Rebecca, head-strong, pampered, she will let no man love her; Inge, tall, blonde, beautiful, she'll stop at nothing to better her life; gentle, naive, Sarah who wants to be a successful seamstress and finds herself trapped, with no where to go; Zeb, a straight-forward, frontiersman, who just wants to be left alone and Jacob, a loud, obnoxious, vile man who would lie, cheat, steal, even murder to get what he believes is his. Follow their saga as they head West, in this, Book 1 of a 6 book saga. The lives of 7 people are inter-woven together, each driven towards a common destiny that brings them to the American West during the year of 1855.